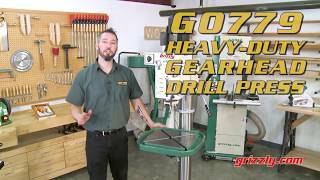 In the world of industrial drill presses, newcomer G0779 is a heavy hitter with a 2 HP, 220V, 8.6A motor, a massive 2-15/16" quill, a 4-1/2" column diameter, and a 1-1/2" drilling capacity in cast iron or 1-1/4" in steel. 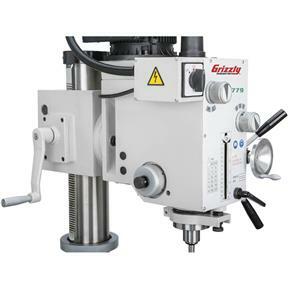 The geared head is equipped with a forward/reverse switch, 6 spindle speeds from 90–1970 RPM, convenient quick-change gearbox controls for spindle speed, and an R-8 spindle taper. 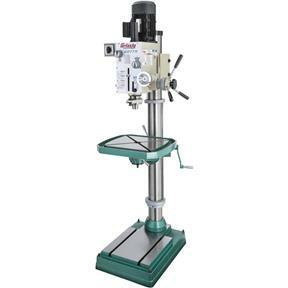 With a swing of 23-3/8" and a spindle travel of 5", this machine can handle whatever comes its way. 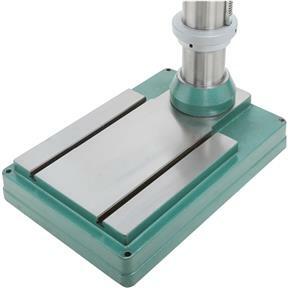 The head tilts 90 degrees left and right, and has a vertical travel of 10-1/2", while the 19-5/8" x 18" table tilts 60 degrees left and right with a vertical travel of 24-3/8". 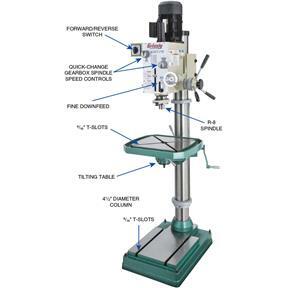 Both head and table are mounted on independent rack and pinions for ultimate positioning versatility. 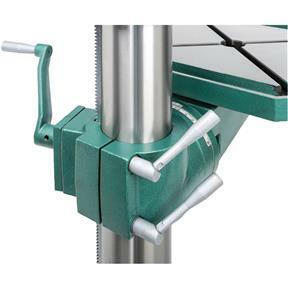 Two 9/16" T-slots are located on both table and base for added usability. The table swivels 360 degrees around its center, and both table and head swivel 360 degrees around the column. 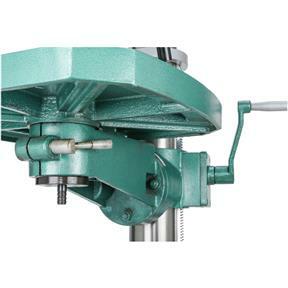 Drilling capacity: Cast iron: 1-1/2", steel: 1-1/4"
Approximate shipping weight: 786 lbs. Although I have had this machine for only about a month, it appears to be a quality product and functions as advertised. 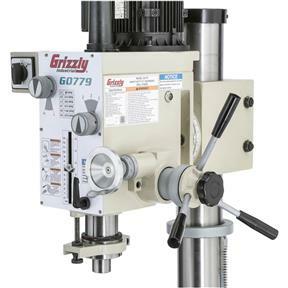 It was damaged during shipment and I worked through that issue with very helpful staff at Grizzly. 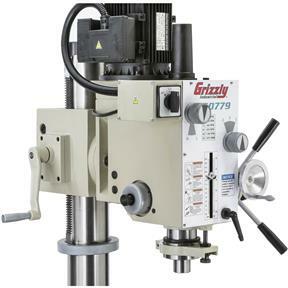 The 3 spindle handles were bent and they are being replaced by Grizzly. Also, instructions state that no oil is shipped in the machine. 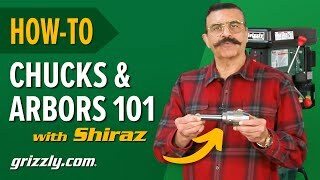 Do not believe that even though no oil shows in the sight gage because if you remove the drain plug before "filling" with oil you may be surprised to find a flood of oil draining from the head. 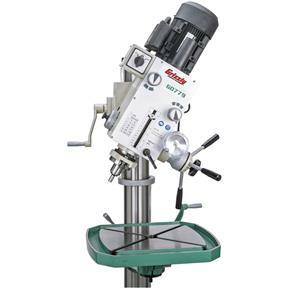 I bought this to replace our aging Grizzly radial head drill press,, this thing is awesome! great power and adjustability!